Rear tine tiller is a handy device for all those who love gardening. But it not an easy task to find the best rear tine tiller as there are so many tillers available in the market. Every machine boasts of extraordinary features, and after buying, only users can know the true colors of those so-called best tillers. To help our readers, we had tried more than 70 rear tine tillers to find the best among them and below five achieved the best scores. We considered several parameters like flexibility, counter-weight, transmission, the strain on arms while working as well as speed modes, etc. while preparing this list. Their functioning in loosening hard soil was taken as the main criteria to prepare this list. Before knowing about the best tillers available in the market right now, you should know the importance of selecting the best. Why Should You Buy A Rear Tine Tiller? Best tillers not only last long but also make your job easier when compared to manually preparing a garden. They are powerful machines, and they can be categorized into different types like CRTs, DRTs, FRTs, and VDRTs. Most of the rear tine tillers are heavy, and wheels are powered by engines to have easy movement. Wheels are also bigger compared to other tiller models. They can do a wonderful job irrespective of the soil type, and that’s the reason why they are more popular than other models. These tillers come up with different transmission modes so that you can re-till areas whenever necessary. Adjustable drag bar is one of the must-have features in tillers, so that adjust digging depth as per your needs. The machine shouldn’t tilt one way while you are tilling and counterweight management plays an important role in balancing so that you can plough hard lands also without losing balance. 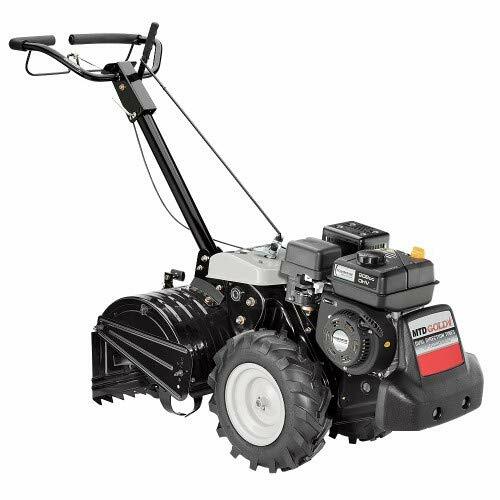 This tiller is equipped with a 4-stroke 205cc engine which is more popular as Briggs and Stratton-900 Series O.H.V Engine. 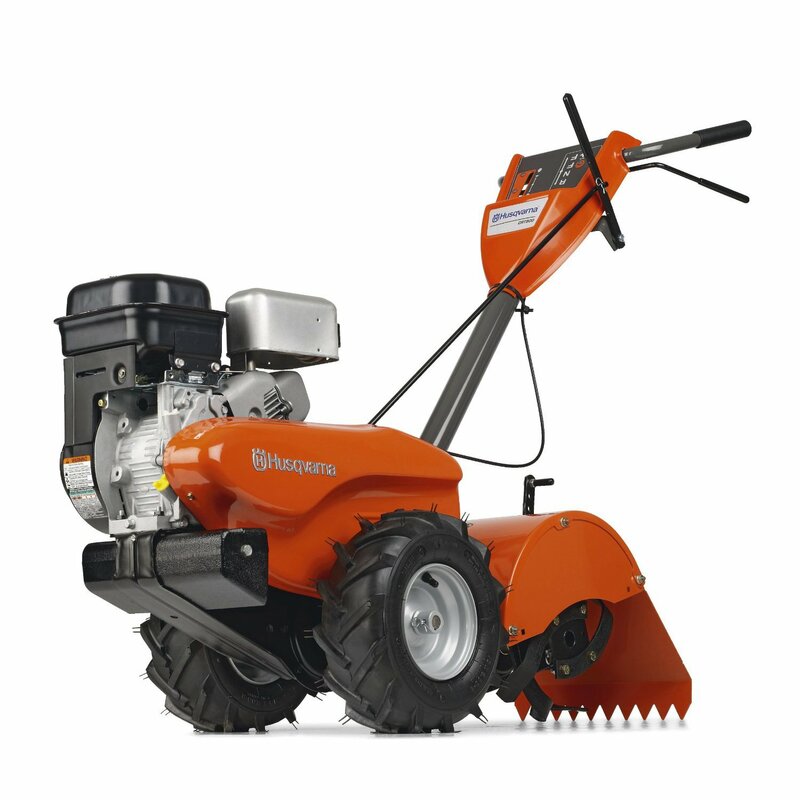 This engine is known for its reliability and performance and Husqvarna made an excellent tiller using this robust engine. It weighs just over 200 pounds and easy to control. It is one of the top rear tine rototillers available under $700 price tag. The protective shield covering the sharp blades not only protects you from accidental cuts but also helps in leveling the soil. This is an ideal workhorse yet easy to handle. 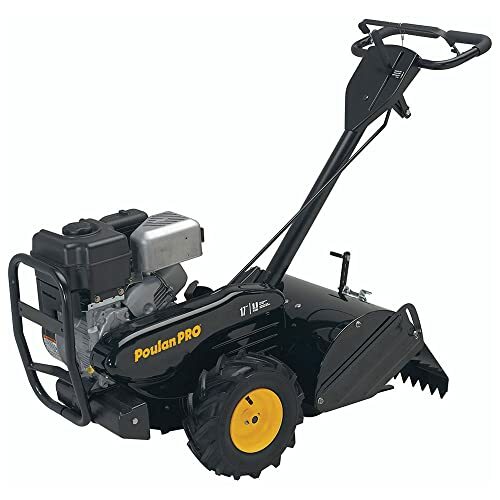 Its high rpm engine provides enough torque whenever necessary and simplifies even the toughest jobs out there in the garden. Front engine design provides the counterweight to maintain balance. 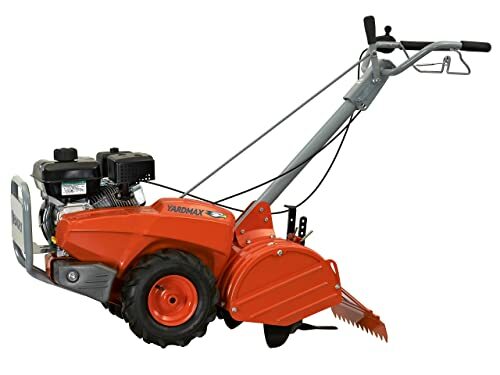 17-inch tilling width is more than enough for all your gardening needs. It looks small in size yet very powerful. Chain transmission so that you can easily reverse directions. The engine also powers wheels so you don’t need actually to push. Can easily cut tree roots and smash rocks if they come in its way. Design-wise, it looks solid and durable. Transmission is a bit confusing and complex. Shifting this machine is nothing less than a heavy workout. The Champion 19-Inch Dual Rotating Rear Tine Tiller is specially designed to be the workhorse behind your gardening passion. With the perfect combination of power and performance, you will surely enjoy tilling your garden. It features a 212cc engine which can produce high energy with the help of the driven gear. The engine is placed in a cast-iron case. And it can transfer the power to the wheels; as a result, the tiller performs flawlessly in your gardening jobs. 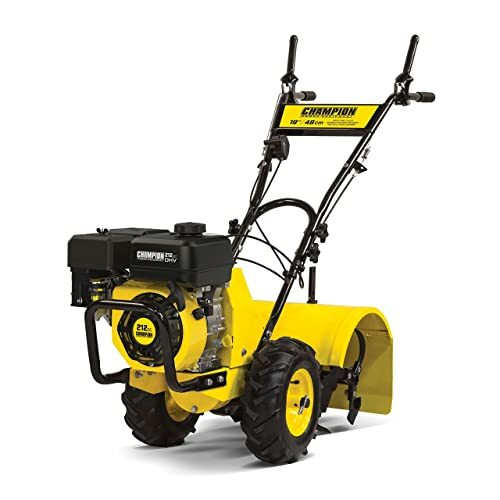 The machine features convenient 13.8-inch handle controls and counter-rotation tilling. And the handle is made out of hardened steel. For that, you get the ultimate versatility and performance. Even you can control the tiller on the most challenging ground as well. Again, you can quickly dig narrow spaces and wide rows of your garden with the adjustable tilling width. It is 19-inch wide and can till up to 8-inches which is ideal for any garden. Besides that, the tine tiller comes with 13-inch self-propelled tires, and these tires have large treads. As a result, they provide excellent traction as they are self-propelled. Aside from that, the tiller machine has an adjustable depth gauge which runs behind the tiller. And it allows you to work at a consistent depth as well as provides you balance in different conditions. Lastly, the tractor is designed with an oil shut-off sensor, and it can hold 0.9 gallons of gasoline as well as 0.6-quart oil. Overall, the rear tine tiller is the perfect machine for the serious gardeners. Poulan Pro has been manufacturing some of the best rear tine tillers for more than seven decades. The company always tries to introduce excellent gardening stuff to their customers. And you will realize that after using Poulan Pro PPCRT17 in. 208cc Counter Rotating Rear-Tine Tiller. A 208cc OHV engine powers the machine. And with the hand controls, you can comfortably move the device to the forward as well as reverse direction. Besides that, the handles are adjustable which can be lowered or lifted to a height as per your need. And you can control the grips with a single hand as well. Again, the machine features 13″ counter-rotating tines which are angled for maximum soil separation and will till down to a maximum depth of 17″. 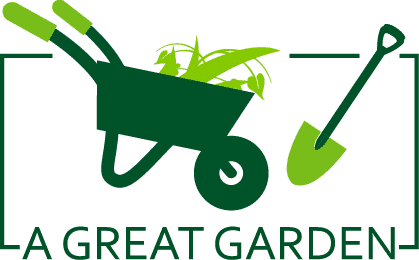 Overall, the tine tiller is easy to use and besides having solid construction, as well as a powerful engine, make this tiller perfect for gardens. Yardmax offers the right solution to do the job properly without paying too much. With the perfect combination of practicality and performance, the company provides durable products which you will find in YARDMAX YT4565 Dual Rotating Rear Tine Tiller. It features a powerful engine which can deliver a gross torque of 9.5 ft/pounds. Besides that, the engine has 190 RPM rotational speed. Again, it has the transmission with the self-propelled drive system which offers one forward and one reverse gear for better control. As a result, you can go with the forward rotation for cultivation and also use counter rotation for deep soil tilling. Again, the machine features 18″ wide rear tine with seven depth adjustments so that it can cover more ground quickly. The tine tiller is easy to use; it allows users to operate with a single hand. Aside from that, it has an adjustable drag bar to maintain optimal balance in all condition. In summary, you can easily till down uneven fields with YARDMAX YT4565. The MTD Gold 21AB45M8704 is one of the more affordable rear tine tillers available in the market. It is beneficial for big gardens. It features a 208cc OHV engine which can produce excellent torque. And the machine is designed with an overhead valve to generate power for the tines. It is adjustable and helps to till down 7 inches. Besides that, the Overhead valve engines are known for their fuel-efficiency as well as their overall reliability. As a result, you won’t need to worry anymore about emitting your tiller. 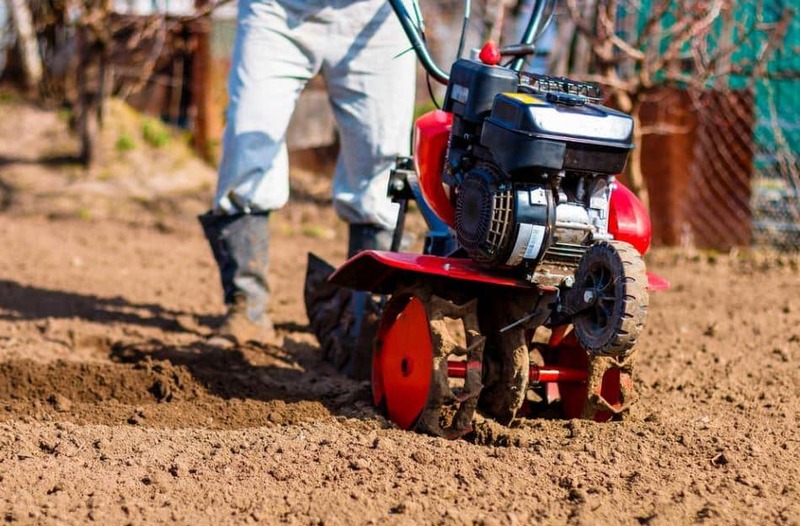 Again, the machine comes with 18-inch tilling width which is the best for cultivating large gardens. And it gives you more flexibility while working in your garden. Aside from that, the 16 inches wheels provide you excellent support during work. They will maintain the balance of the tiller so that you can work faster. In a nutshell, you can experience smooth and balanced maneuvering with the help of MTD Gold 21AB45M8704. Rear tine tiller is a one-time investment and the thing you bought should work for at least six to seven years. Also, they are not cheap and it is always better to go through the rear tine tiller reviews before buying one. Here are some essential things you must know before buying. Of all the different tiller options available, rear tine tillers are more powerful. Based on the rotating direction of the tines concerning wheels, these workhorses can be mainly categorized into three types. Forward rotating tillers where tines and wheels both move forward. In the counter-rotating tiller, tines move in the direction opposite to the movement of wheels. The last one is dual rotating tillers, and it is a combination of the above two. Weight of the tiller will play a crucial role in handling the tiller especially during turns. If they weigh less, you can easily control them, and you can also quickly move them when the engine is off. It is always better to go with lighter versions and in general, heavy ones come with more powerful engines. Some tillers even weigh more than 250 pounds and most of the times; you don’t need to push tiller as the engine also powers the wheels. These two parameters play an essential role in selecting the tillers and most of the tillers that are available these days can easily dig up to ten inches. It is better to opt for them than models that can only dig up to six inches. Digging width mainly depends on the number of tines and most of these working horses are now coming up with the 24-inch width. If your garden area is small, it is better to go with small sizes. You can go through growth manuals to understand the width and depth requirements of different plants. There won’t be any use if the tiller stops working within a month or two after buying. So, it is essential to do some research about seller and manufacturer. Just going through the reviews on e-commerce websites won’t be sufficient and you must know the detailed specifications of the engine, basic working, transmission modes, etc. Some bolts, pins are more prone to wear and tear and going through these minor details will surely reduce maintenance costs. Know whether every penny you are spending on the machine is worth or not. Check different sources as price variation will be very high in gardening materials. Also, go through all the machines that are available in the same price range and machines with same specifications but from different sources. This method will surely help in deciding your final selection, and you can also save your hard earned money.Power: Most of the tillers that are available in the market are equipped with powerful engines, and you must select the one that best suits you. Some engines work on gas whereas some engines need a mixture of oil and gas.Take this parameter also into consideration before buying. If you are in need of some powerful machines, go with 350cc or 500cc engines, but in most cases, 200cc engines will be more than enough. Take other parameters like the density of vegetation, nature of the soil, etc. also into consideration while finalizing your choice. All the models that are mentioned above are based on reliable rear tine tiller reviews and we had personally tried all the five of them. Whatever may be your requirement, you can choose one from our list and each one of them is equipped with great machinery. As tillers are heavy machines, it is better to follow the advice mentioned above to select the best one. Finally, these machines are one time investments and don’t hesitate to spend few extra bucks. Proper care, cleaning and regular maintenance will surely increase the lifespan of these machines.